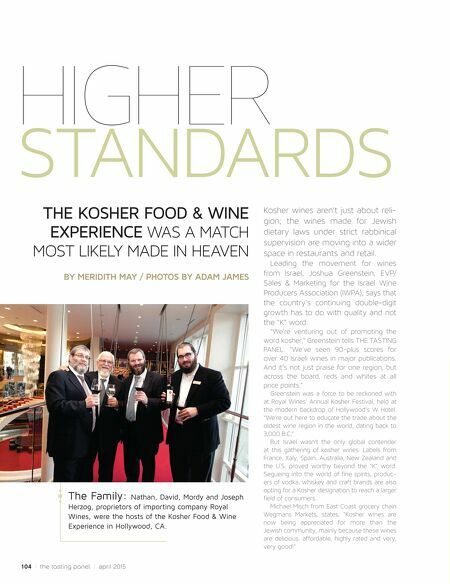 104 / the tasting panel / april 2015 HIGHER STANDARDS THE KOSHER FOOD & WINE EXPERIENCE WAS A MATCH MOST LIKELY MADE IN HEAVEN BY MERIDITH MAY / PHOTOS BY ADAM JAMES Kosher wines aren't just about reli- gion; the wines made for Jewish dietary laws under strict rabbinical supervision are moving into a wider space in restaurants and retail. Leading the movement for wines from Israel, Joshua Greenstein, EVP/ Sales & Marketing for the Israel Wine Producers Association (IWPA), says that the country's continuing double-digit growth has to do with quality and not the "K" word. "We're venturing out of promoting the word kosher," Greenstein tells THE TASTING PANEL. 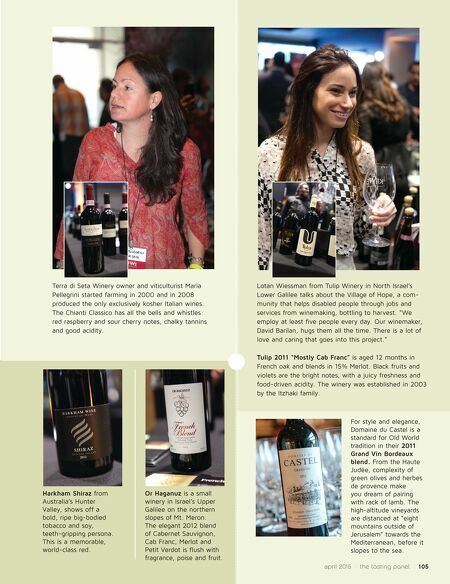 "We've seen 90-plus scores for over 40 Israeli wines in major publications. And it's not just praise for one region, but across the board, reds and whites at all price points." Greenstein was a force to be reckoned with at Royal Wines' Annual Kosher Festival, held at the modern backdrop of Hollywood's W Hotel. "We're out here to educate the trade about the oldest wine region in the world, dating back to 3,000 B.C." But Israel wasn't the only global contender at this gathering of kosher wines. Labels from France, Italy, Spain, Australia, New Zealand and the U.S. proved worthy beyond the "K" word. Segueing into the world of fine spirits, produc- ers of vodka, whiskey and craft brands are also opting for a Kosher designation to reach a larger field of consumers. Michael Misch from East Coast grocery chain Wegmans Markets, states, "Kosher wines are now being appreciated for more than the Jewish community, mainly because these wines are delicious, affordable, highly rated and very, very good!" The Family: Nathan, David, Mordy and Joseph Herzog, proprietors of importing company Royal Wines, were the hosts of the Kosher Food & Wine Experience in Hollywood, CA.